USPS Certified Mail forms are available at the Post Office free. But if you want to save time and money go online to Certified Mail Envelopes to address, track and print USPS Certified Mail bar codes and tracking numbers with PC Postage. You can save $2.05 per green card mailing! The number of USPS Certified Mail compliance mailings are higher then last year’s mail volume and many companies are struggling to keep up - not to mention they desire to save time and money. The traditional Certified Mail forms available from any Post Office includes USPS forms PS-3800 and forms PS-3811 the Domestic Return Receipt (Green Card) that is to be completed and affixed to each Certified Mail letter. The sender can hand print the address of the recipient and your return address on both USPS cards then apply the sticker of the Certified Mail tracking number onto both copies. The USPS forms are then affixed to the outside of the envelope and proper postage is placed on the envelope $6.74. Other semi-automated laser forms allow you to use software to address then print a label. The process was nicknamed ‘peel and stick’ because each label has to be carefully peeled from the adhesive then stuck on to each envelope. This process is time consuming and requires labor to properly affix the forms, and match up the USPS tracking numbers and then file the return receipt green cards when they are returned. On average, one person can complete eight letters per hour using this type of process. In today’s changing economic times USPS Certified Mailings are on the increase. Today, companies that use to send ten or twenty letters a month are now sending twice as many letters monthly. Financial and compliance mailings have increased in the financial and investment sector. It’s truly a sign of hard times for many companies and individuals. Today businesses are seeking faster, easier and automated ways to send USPS Certified Mail. According to Myrna Brown – Senior Vice President at Certified Mail Envelopes, everyone wants to automate the process. This is the service we provide… a fast and easy way to automate and send USPS Certified Mail that provides compliance information including Certificates of Mailing, delivery confirmation, Signatures and more. Our automation provides our clients the ability to print USPS Certified Mail barcodes, calculate postage amounts, Electronic Return Receipts, Signatures, tracking and delivery reports that are stored for 7 years in an off-site data warehouse. Everything is web-based and can be accessed 24/7, 365 and printed to your local printer as needed. Certified Mail Envelopes, Inc. is USPS approved and uses a patented system and Certified Mail Envelope to interface with USPS, address the letter, calculate postage, print barcodes, track, store and print delivery confirmations including Signatures for compliance mailings. No labels, stickers or forms are used. No more green cards that get lost and are difficult to file. The automated process uses a special Certified Mail Envelope that works with the free web software and Electronic Return Receipt. Most letters weighing less than 1 ounce costs just $4.69. 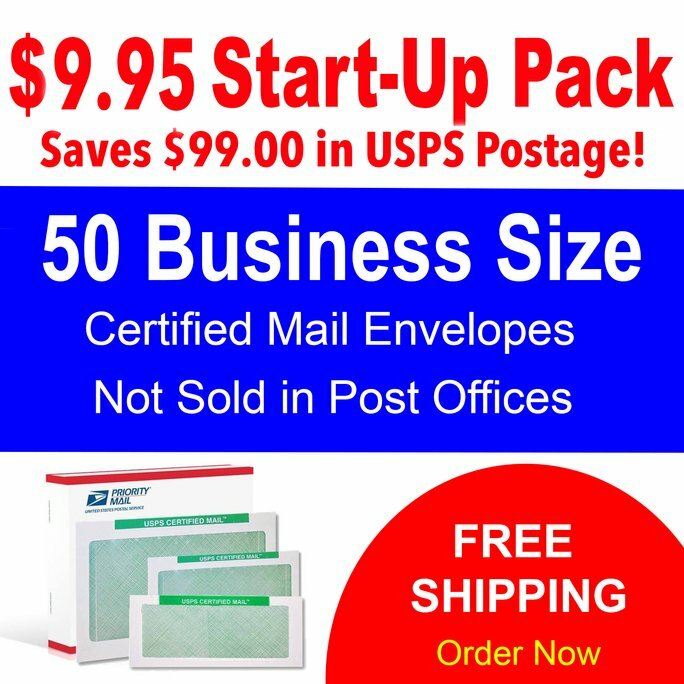 This price beats the $6.74 postage costs most companies are still paying today to send a USPS Certified Mail letter today – not to mention all the internal administration time and material costs associated with old-fashioned manual the process. Certified Mail Envelopes is helping companies of all sizes go green and get automated! They are always available to consult companies about integration and provide enterprise solutions to address, track and print USPS Certified Mail with Electronic Return Receipts (green cards) and Signatures. The company provides business mailers and mail houses an automated process to mail tens of thousands of USPS Certified Mail letters in what’s called a ‘Light Out’ process to automatically complete each step of sending USPS Certified Mail and provide proof of mailings, letter tracking, delivery confirmation with Signatures without using any certified mail forms. To learn more about automating USPS Certified Mail contact Myrna Brown at Certified Mail Envelopes at 800-406-1792 ext 707.